QVC is the dream of many entrepreneurs, but the popular retail channel requires a lot of preparation and money. WEST CHESTER, Pa. (MainStreet) -- Getting on QVC is probably the dream of every entrepreneur with an item or gadget to sell. But while the payoff could be millions, the experience of selling through the popular TV retailer requires a lot of preparation and money. QVC is the dream of many entrepreneurs, but selling through the popular retail channel demands a lot of preparation and money. Celebrating 25 years, QVC, now a subsidiary of Liberty Interactive Group ( LINTA, claims more than 98 million U.S. households and roughly 195 million households worldwide are in its reach through cable and satellite. Krepak says her product fit with other QVC offerings because its target market was women and Card Cubby is "easily demonstrable," and there's evidence that's true: Card Cubby has been on QVC 15 times since July 2009, selling approximately $200,000 worth of wares, she says. (The company is approaching $900,000 in total sales this year.) But first came the preparation that ensured the product met QVC's specifications. Here she offers her experience on getting on and selling through the popular shopping channel. 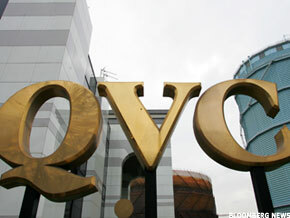 How did you apply for QVC? Krepak: When I introduced Card Cubby in 2009, I put an ad in Real Simple magazine ... in addition to getting a lot of orders, an outside QVC rep contacted me. At that point I had never shopped on QVC. She took it to QVC, and while she was in the middle of conversation with them, I attended the Atlanta Gift Show where a buyer from QVC noticed the product as well. When I got home I got back in touch with my rep and we proceeded to get on QVC. Once you decided to go ahead with QVC, what preparation was needed before the first Card Cubby was even sold? Krepak: QVC has a minimum retail order. When you start with them they usually want to order about $50,000 worth of retail value. They will give you a purchase order and ask how long it takes for you to manufacture and get them the product. You wouldn't want to place your order with your manufacturer until you have the signed purchase order in your hand. When you get the product, you have to package it in the manner they tell you. So by the time QVC gets it in their warehouse all they have to do is pick up the box, slap on the mailing label and out it goes. You have to do all the preparation. People need to realize that there are costs associated to all this, so when they're agreeing to their pricing with QVC they need to make sure they're accounting all these other costs, particularly when you're a new company. What happens during the on-air shoot of the product? 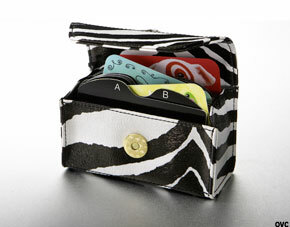 Wendy Krepak's Card Cubby mini-organizer was discovered at a trade show by QVC representatives. Krepak: You have to go through a class at QVC if you're going to be the on-air person, which they prefer. You have to be certified, which entails days' worth of training. I went on-air a couple of times but I ended up hiring someone because it got to be too much to go back and forth to Pennsylvania. You have to earn your stripes through QVC. You may have a 3 a.m. airing, but you have to meet with your host before you go on and your host may start at 1 a.m. So you have to be there about 12 a.m. and sit there and wait, because you have to meet the host. With every QVC presentation, time slots have certain amount of sales that you have to meet. If you don't meet the sales per minute for that time slot, they're unlikely to have you on again. I never had that happen. I was really lucky -- even in crummy time slots we always exceeded our sales. In addition to which, you can shop online where their big thing is customer ratings. So all these people who buy your product rate it and comment. We were really lucky. We were customer top-rated. QVC has such a great reputation for their products and they put you through a really thorough review in all aspects. They won't let you say anything on-air that isn't approved by attorneys. I have a whole new respect for them. What were some of the biggest benefits to going on QVC? Krepak: I wanted to do it because we were new. I wanted it for brand recognition and product recognition. Even though your margins are a lot slimmer because of the costs associated -- you don't make as much money per unit selling -- in other ways you can't buy that kind of TV advertising. The other thing is when someone sees you on QVC you get all sorts of offshoots. Other retailers get interested in you. QVC gives you so much credibility. And the cons to going on QVC? Krepak: For me the problem is that you have to have money, because what happens is you get paid 30 days from when you sell from a particular airing. It becomes a cash flow issue. You have to just know and be able to deal with that cash flow issue. You're going to get paid in dribs and drabs. You need to expect returns. QVC has a reasonable return policy, and because of the way people shop, maybe they buy too much -- you will have to deal with returns. I think people have a skewed idea of what they're going to do in sales and profit. People need to realize what the real value is on QVC -- it's the branding, it's the exposure, it's the things that come off of it. How many times did you agree to be on-air? Krepak: There is no contract. All you do is sign off on the purchase order. So what happens is that their programming department decides when you're going to be on. You don't know. You could be on once and have to wait to hear again. This year we haven't been on -- and they placed a big order -- because of cash flow. We're growing so much in other areas that we couldn't deal with the slow payments. Is there anything you do differently in the experience? Krepak: I'm not sure I would do anything differently. I think it's been an absolute fabulous experience for the credibility. We had some big retailers come to us. We had a lot of different groups that are interested in doing more things on TV. I would recommend that anyone do it, but you just have to know what you're getting into. How is the company growing? Krepak: We probably grew by about 40% this year so far, and that's a mixture of online sales and retailers that are selling us now, which is why it become problematic to tie up the cash. We can only get so much product. That's one of the growing pains, and getting money from banks right now is like a joke. >>Do Pop-Up Stores Make for Good Tenants?